Proper design of foundation of civil engineering structure, need sufficient knowledge about subsurface condition of proposed site upon which foundation is to be supported. Arrangement and orientation of underlying soil layers and physical properties of each layer, extent of each layer are the necessary information in deriving both bearing and settlement behavior of foundation soil. To obtain essential information like these, through laboratory and field testing, subsurface investigation is conducted. In this process soil samples are collected from shallow and deep strata. 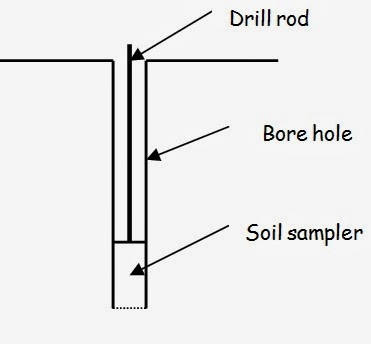 The method by which soil sample is collected is called sampling. Different types of sampler are used in this purpose depending on sample type and difficulties in collecting this. In this technique, block samples are collected by hand cut. This is considered as the best techniques to collect samples in terms of sample quality i.e. this produce less disturbance to sample. In soil sampling, we all know the importance of undisturbed sample though it is a theoretical term. In this technique surrounding soil of sample is excavated to collect sample and the sample is collected in a box. Being best quality sample, in many situations, however, it is not the best technique considering practicability and the most dominating factor economy. This is widely adopted technique for collecting sample, especially form a considerable depth. A sampler is fitted to drill rod of boring apparatus is lowered through a dug hole in ground by removing soil using any of usual boring techniques. After reaching sufficient soil sample into sampler, it is sheared at its base by rotating.